When I think of comfort food, I automatically think of creamy risotto. Forget chicken noodle soup or mac 'n cheese (although I do love those too). But if I am craving a warm bowl or plate of comfort, risotto is by far my go-to. Many people I know are intimidated by the whole cooking process of making risotto, but don't be! Once you have the technique down (and when I say technique, I mean scooping ladles of heated broth a little at a time into a large skillet- easy, right? 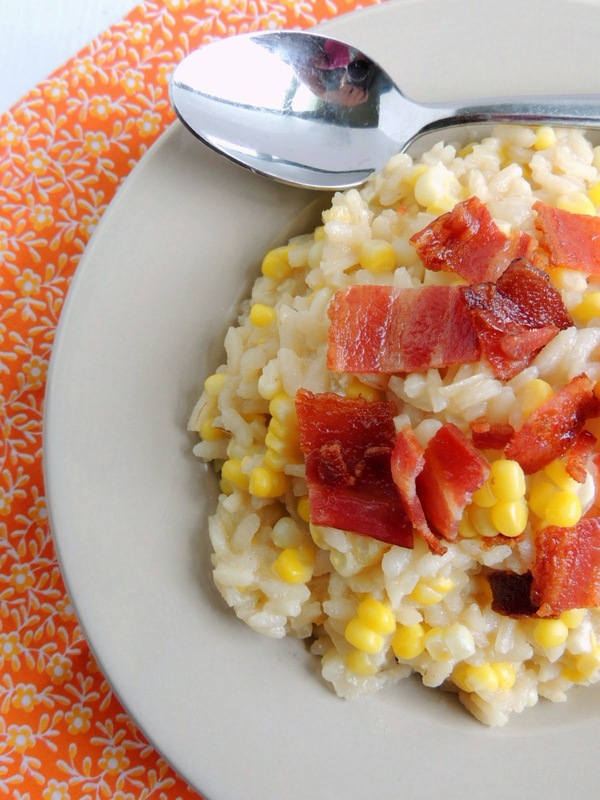 ), you will want to make risotto all the time. Cook your bacon using your preferred method. I prefer to bake mine- CLICK HERE for my how-to on How to Bake Perfectly Crisp Bacon. No matter how you cook it, be sure to reserve some of the bacon grease. Pour the chicken broth into a large saucepan. Over medium-low heat, start to slowly heat the broth to a low simmer. Heat the olive oil and reserved bacon grease over medium heat in a large dutch oven or large deep skillet. Then add in the onion and saute for a quick minute or two. Add the arborio rice to the onion. Saute for another 1-2 minutes to slightly toast the rice. Using a ladle, scoop in one ladle full of the chicken broth. Cook and stir over medium-low heat until all the liquid is absorbed. Continue doing this- ladling in the broth, stirring until absorbed until you have used all the chicken broth. This entire process should take between 30-35 minutes. 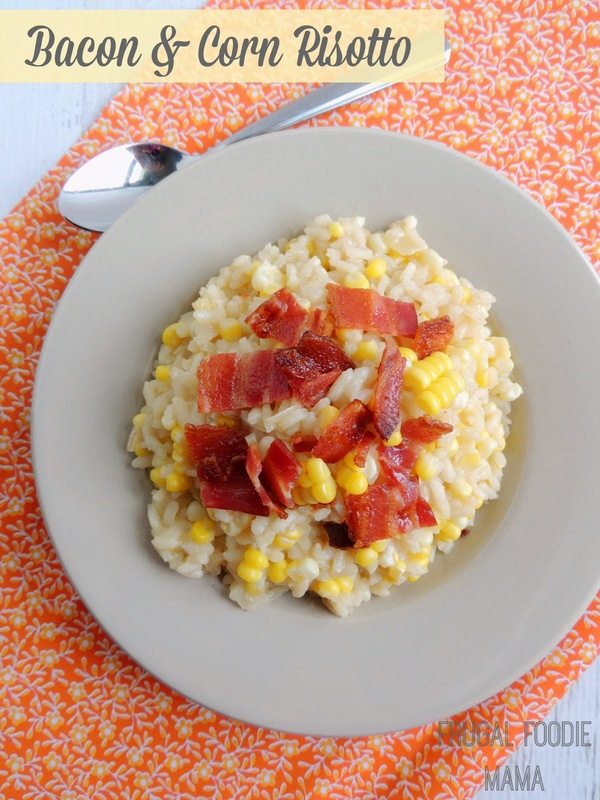 Once your risotto has absorbed all the liquid, stir in the fresh corn kernels and stir to heat through for 2-3 minutes. Remove from the heat and then stir in the plain yogurt until creamy. Top each serving with a generous sprinkle of the chopped bacon. Are you a risotto novice or an old pro? 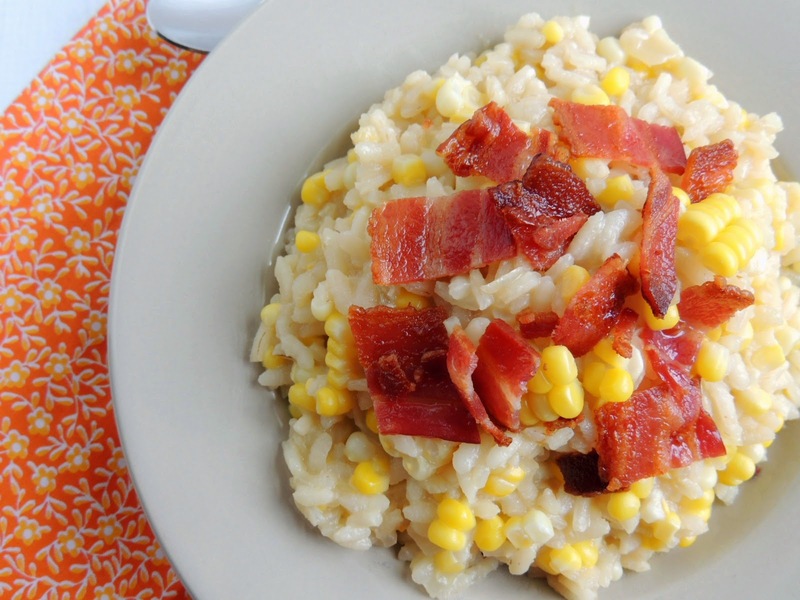 What are your favorite flavor combinations in a homemade risotto? 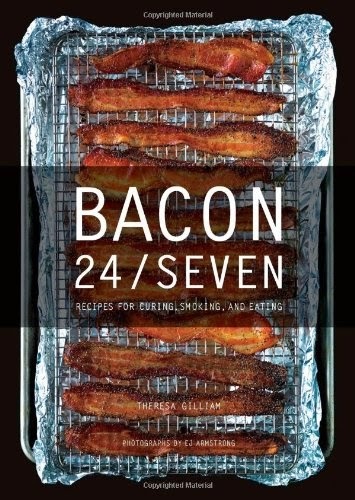 Be sure to pop over & get entered to win a copy of the Bacon 24/Seven Cookbook this week! 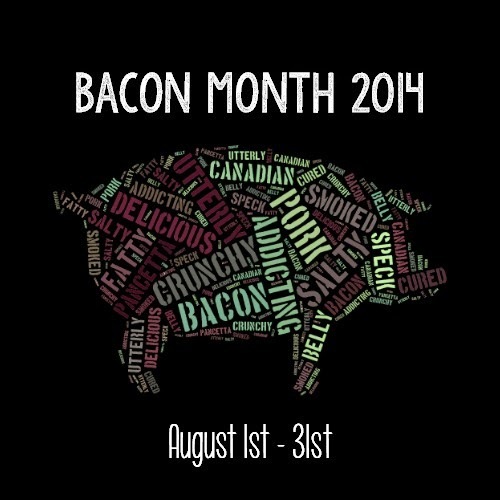 We will be giving away a new bacon-centric cookbook each week of Bacon Month!